Priming coat to reduce low- and high frequency electromagnetic pollution (electric smog) in the interiors. Black pigmented, special electroconductive coating product for large-area reduction of alternating electrical fields (low frequency), e.g. alternating voltage in electric cables, installations, equipment, walls, etc., and electromagnetic waves (high frequency), e.g. transmitters, radar, radio link systems, mobile (cell) phones, wireless phones, etc. Particularly suitable for use in sensitive areas, such as e.g. nurseries, bedrooms, living- or hotel rooms, offices, hospitals, sickrooms and surgeries, kindergartens, schools, etc. 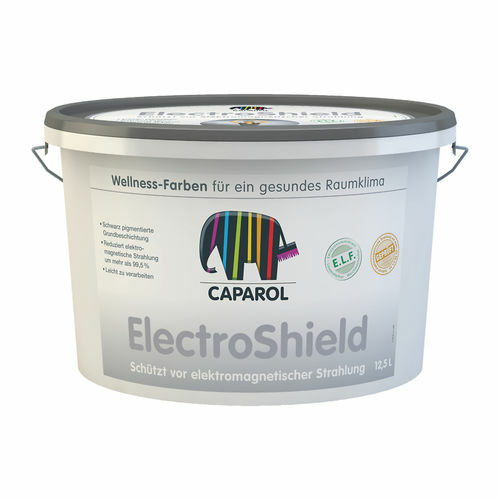 Electroconductive, reduces over 99.5 % of radiation. Water-thinnable, ecologically compatible, low odour. Synthetic resin dispersion/emulsion according to German standard DIN 55945.